I mean, why be a truck when you could be one of the coolest video game consoles ever? Smart choice, Optimus. I love that it comes with a memory card for no real reason. And that the controller is part of the transformation too. Unfortunately despite the anniversaries being this year, Takara Tomy won't release Optimus until February of next year, and he'll set you back a pretty penny if you're going to try and import it. Such beauty apparently has an asking price of 10,000 yen - or around $90. 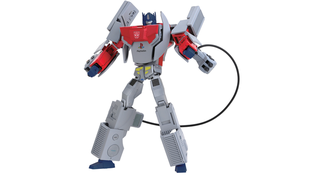 You could probably get an original Playstation 1 for a lot less than that these days, but would it turn into Optimus Prime? No, no it wouldn't. If you're looking to preorder, you can do so at import-friendly sites like Ami Ami or Hobby Link Japan.